The 10/22® Hammer Tune Kit produces a lighter trigger pull with a faster lock time. The sear engagement surfaces are precision ground and vapor honed. 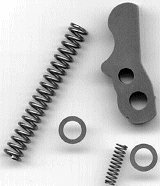 The kit includes a new hammer, extra power hammer spring, two .004" shims and a new trigger return spring. This hammer, when used with proper engagement of the factory sear, will produce a trigger pull of 2.25 - 2.5 lbs. Easy install. Trigger pull is 3.25 pounds. Advertised says that it should be a pound less.